Grand Rapids, MI: Zondervan, 2010. Ed. 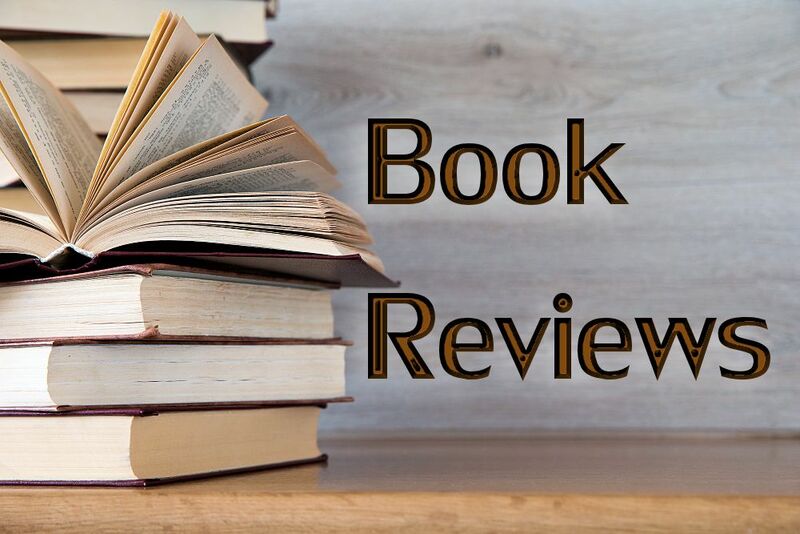 Note: Since this review was published, Rachel Held Evans’ first book has been republished under the title of Faith Unraveled: How a Girl Who Knew All the Answers Learned to Ask Questions. Grand Rapids, MI: Zondervan, 2009. Back in 1967, if anyone had told me that an evangelical publisher would release two excellent books about the central role of doubt and questioning in the faith-experience, I’d have felt a shot of hope and joy that was unknown to me when I was 35. 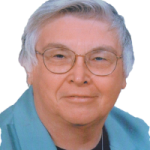 I had spent over a decade teaching in fundamentalist colleges, surrounded by a set of doctrinal “certainties” that dulled the wits and stifled the creativity of many of my students. In response, I wrote my first book, Adamant and Stone Chips: A Christian Humanist Approach to Knowledge. In it, I asked conservative Christians to turn away from their “apparent lack of the self-critical faculty, inevitably combined with an unpitying coldness toward human complexity, a total ignorance of ‘the delicate and subtle interplay of conscious and unconscious factors’ which make easy judgments impossible” (p. 98). And now here I am, 44 years later and long since retired, rejoicing to hold in my hands two books by younger evangelicals arguing for the deepening of faith by facing all the doubts that may arise. Rachel Evans puts it this way: “Perhaps our love for the Bible should be measured not by how valiantly we fight to convince others of our interpretations, but by how diligently we work to preserve [protect?] a diversity of opinion” (p. 194). And David Dark writes, “The call to worshipfulness… is a summons to mindfulness in all I say and do, a mindfulness that requires… a questioning of everything” (p. 145). Could it be that Christian humanism is awakening in the minds of younger evangelicals? If so, let it be, dear Lord, let it be! (Unfortunately, these publications may be due to the fact that Zondervan has recently become a subsidiary of HarperCollins Publishing Company). Whatever: these books by evangelicals are available, and are wonderful tools for awakening creative questioning in ourselves and others. In case you didn’t know, Monkey Town is Dayton, Tennessee, the scene where in 1925 a teacher named John T. Scopes was tried for teaching Darwinian evolution in the public school. Defended by Clarence Darrow and prosecuted by William Jennings Bryan, Scopes was found guilty in what became known as the ultimate legal showdown between science and religion. Now, 85 years later, a graduate of Bryan College in Dayton has written a book about her faith journey from a mind-set of blaming crime on the removal of prayer from the public schools and believing Clinton supporters would go to hell, to a determination to follow the liberating and loving teachings of “Jesus the radical rabbi” (p. 174). 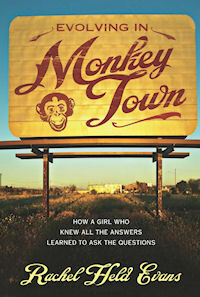 Rachel Held Evans writes well, and Monkey Town is the quick-moving and compelling story of a thriving faith. She documents her “crippling lack of curiosity” and how she comes to realize that “doubt is the mechanism by which faith evolves” (pp. 218-19). She doesn’t know whether to call herself an inclusivist or a universalist or a particularist, but she agrees with what C.S. Lewis wrote in Mere Christianity: “We do know that no person can be saved except through Christ. We do not know that only those who know Him can be saved by Him” (quoted on p. 130). Those words got Rachel Evans through her sticking point, because (like me) she had found herself unable to love a God who would condemn to eternal Hell people who had been born into families or places where they would never hear a word about Jesus. By contrast to Monkey Town’s fast pace and often humorous tone, David Dark’s The Sacredness of Questioning Everything is crammed with literary, cultural, and theological sophistication. One must read slowly in order to comprehend the many insights that come zooming through chapter after chapter about questioning: questioning first God, then Religion, then our Offendedness, Passions, the Media, Language, Interpretations, History, Governments, and the Future. To try to hurry might be to miss some of the memorable phrases turned by a skilled stylist: “a fanatic is someone who can’t change his mind and won’t change the subject” (p. 50); television is “an electronic soul molester” given to “mind massage” (p. 70); “budgets are moral documents” (p. 191); “a religiosity of care, of lived reverence… is our only home and our only hope” (p 221); and “I believe in hope… in the cosmic recovery in which nothing will be lost and nothing will go unredeemed” (p. 185). Since David Dark is such an adroit wordsmith, I was delighted that he insists on using the term evangelical in positive ways. (Old timers in EEWC will remember our drawn-out struggles about whether or not to drop evangelical from our title, since it has been associated with some truly disgraceful public policies.) 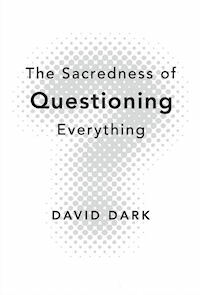 Typical of Dark’s stance is the following: “I want to reposition the hot-button term evangelical as the ‘good news’ that questions all versions of the future, with an insistence on prioritizing conditions that sustain human life” (p. 227). And he goes on for pages about the “intentionally evangelical work of U2,” classifying Bono with Isaiah and Jesus as people “properly described as evangelical to bring good news to the poor” (p. 231). For David Dark, resurrection is “a moment in which human beings are reintroduced to each other across the gulf of mutual resentment and blame”—and for him, this is a “robust evangelical account of resurrection practice” (p. 215). Some citizens of Omelas cannot bear this arrangement and walk away, out into the unknown darkness—but nobody knows where they go and their leaving does not help the child in any way. Furthermore, even as they walk away from Omelas, they are still wearing “the city’s fine clothes and comfortable shoes” (pp. 236-7). Readers of CFT will of course recognize the “Omelesian economics of our own day,” the wealth of top-tier Americans oppressing the lower classes, and America’s wealth in general drawing resources away from desperately poor and powerless nations. How can we walk away? How can we not walk away? What good will it do to walk away? Having dropped all this into our consciences, Dark’s comment is simply that “The Lord’s Prayer posits an evangelical economics that is good news, first of all, for the least of these” (p. 238). © 2011 by Evangelical & Ecumenical Women’s Caucus. Originally published in the Summer (July-Sept.) 2011 year issue of Christian Feminism Today, Volume 35, number 2.